John Pollock and Wai Ting review WWE SmackDown from Everett, Washington. 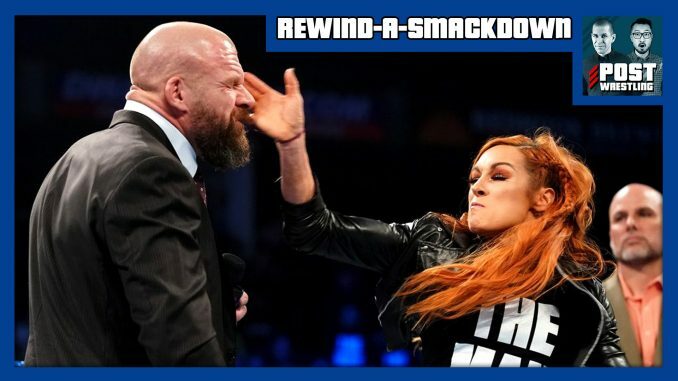 On this week’s show from Daniel Bryan’s home state, the WWE champion took on Jeff Hardy in a non-title match, Becky Lynch and Triple H have a heated confrontation, the final women’s team for the Elimination Chamber was confirmed, Randy Orton took on Mustafa Ali, and the odd team of Shinsuke Nakamura and Rusev faced off with Karl Anderson and Luke Gallows. NEWS OF THE DAY: The WWE sets return date for Saudi Arabia, WWE injury updates for Seth Rollins, Sasha Banks & AJ Styles, Raw’s viewership, ESPN+ hits 2 million paid subscribers, Katsuya Kitamura leaves NJPW. Wai Ting shares his thoughts on the WWE Network’s presentation of the Worlds Collide tournament taped over Royal Rumble weekend. John Pollock discusses what worked and what didn’t on the MLW Superfight special from this past weekend on beIN Sports featuring two new champions. We review the latest Being the Elite Ep. 137 “Handshake Agreement” with the Young Bucks confronting Pentagon Jr. and Fenix at the “Come Hell or High Water” event, a visit to the MGM Grand and Kenny Omega’s big decision. Plus, a discussion on Impact Wrestling’s Go for Glory feature on the GWN app.